The painting of the square and cathedral in the town of Xanten in the North Rhine-Westphalia region of Germany. 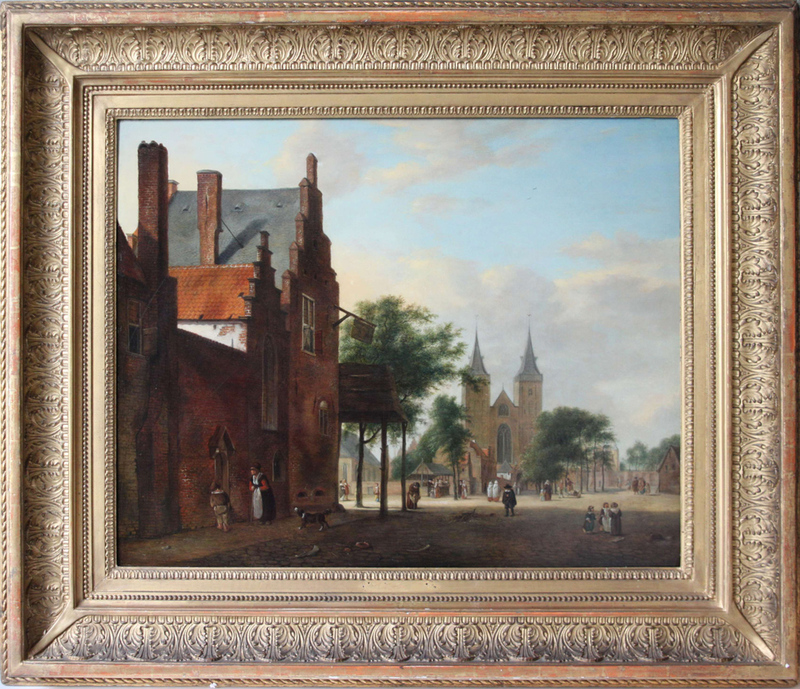 A copy of a known work by the Dutch painter Jan van der Heyden, it has now been returned to the heirs of its original owners from whom it was seized by the Nazis. It has also emerged that, controversially, the picture had previously been sold back to Hoffmann’s daughter in the 1960s despite attempts by the original owners to trace their looted art collection after the war. The resolution of the eight-year case has now led to further questions surrounding other works that are believed to have been returned to the relatives of high-ranking Nazis officials by state authorities in Germany. The painting of the square in the town of Xanten in Germany, a copy of a known work by the Dutch artist Jan van der Heyden (1637-1712) which is now in the Louvre, had originally belonged to Gottlieb and Mathilde Kraus. The family formed a notable art collection which was kept in their apartment in Vienna before they fled the Austrian capital in April 1938 and emigrated to the US. After their entire art collection was appropriated by the Gestapo in 1941, the picture entered the possession of Hoffmann, Hitler’s friend and photographer who also was the father-in-law of Baldur von Schirach, the Nazi Governor of Vienna. 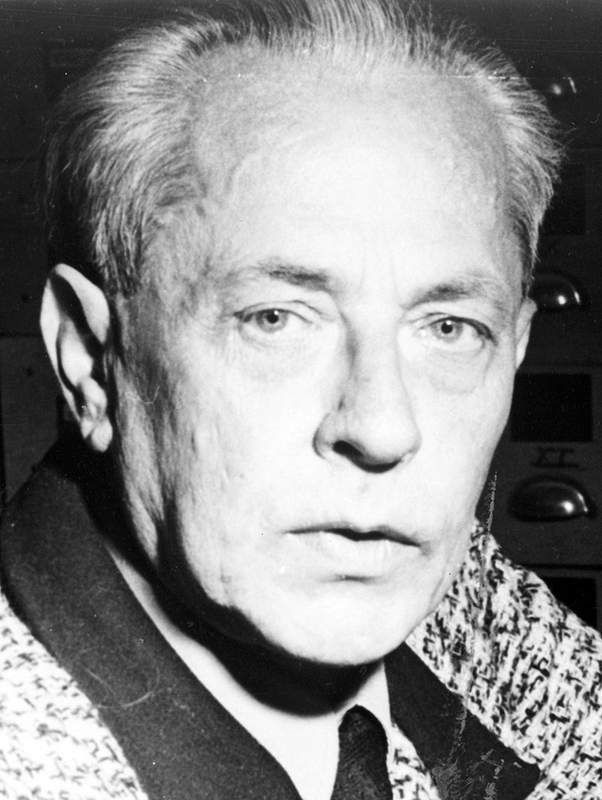 Heinrich Hoffmann, the Nazi photographer and publisher in whose collection the picture entered after it was seized by the Gestapo in 1941. Image via Commons Wikimedia. Allied officers found Hoffmann’s art collection at Schloss Dietramzell in Bavaria in May 1946. The painting was one of a large number of looted artworks that was then sent to Munich to be photographed and inventoried with the intention of restoring them to their rightful owners. Although the Kraus family made efforts to find and recover their art collection after the war, this painting was transferred to the Bavarian State Paintings Collections in Munich in 1959 before then being handed back to the daughter of Heinrich Hoffmann in 1962 as part of a ‘return sale’ for 300DM. The following year Henriette Hoffmann von Schirach sold the painting through Lempertz auction house in Cologne for many times this amount – 16,100DM. It was bought by the Xanten Dombauverein – a body that maintains the gothic Roman Catholic cathedral of St. Viktor, Xanten which is depicted in the van der Heyden painting. The Dombauverein had no knowledge that it previously belonged to the Kraus family. In 2011, after the painting was finally tracked down, a restitution claim was submitted by the Commission for Looted Art in Europe on behalf of the Kraus family. Following a recent agreement finally being reached after eight years, the Xanten Dombauverein has now returned the van der Heyden painting to the Kraus heirs. The hand-over took place in a ceremony at the cathedral on March 21. John Graykowski, right, the great-grandson of Gottlieb and Mathilde Kraus, the original owners of the painting from whom it was seized by the Nazis. 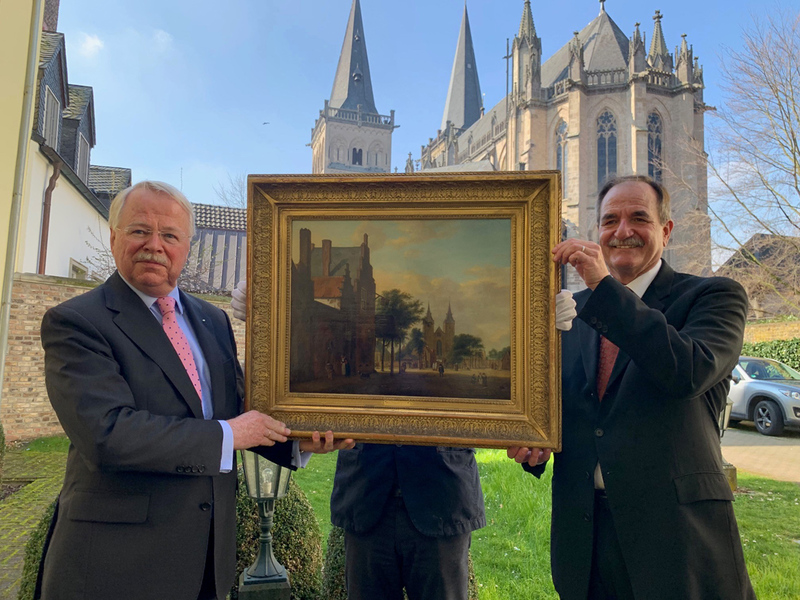 He is pictured outside Xanten Cathedral in Germany with Hans-Wilhelm Barking, left, the Chairman of the Dombauverein which has returned the painting to the family. The family have now recovered seven of the more-than 160 paintings that were seized in 1941. The previous six were found in Austrian museums and returned in 2002 and 2004. John Graykowski is keen to recover the remainder of the works including a Nicolaes Berchem (1620-83) landscape that was also acquired by Heinrich Hoffmann and returned to his daughter by the Bavarian government in 1960. Despite repeated attempts being made, neither the Bavarian government nor the von Schirach family have responded to requests from the Kraus family for information about the current location of the painting. Co-Chair of the Commission for Looted Art in Europe Anne Webber told ATG that, in researching the provenance of the van der Heyden painting, it became clear that the way Bavarian authorities ended up returning this piece of looted art to the family of the high-ranking Nazi who seized it was “not an isolated case”. She said that the Commission discovered that many paintings and other cultural items were secretly returned to families of leading Nazis over a period of 20 years after the war, including the families of Hermann Göring and Hans Frank. She added that this issue has been the subject of an investigation in the Bavarian Parliament and a further German-government funded investigation is due to be published shortly. As well as calling for transparency so that all state documents, auction house records and museum archives are made “open and accessible”, she also called for a change to the current German law whereby foundations and charities are not legally obliged to return looted works. She said she hopes that the van der Heyden restitution will set a precedent, even in the absence of legislation. “Almost 75 years after the end of the war, and even in such a clear-cut case as this, there is in Germany still no obligation to return Nazi looted art, despite many statements of intent from the German authorities. Chairman of the Dombauverein Hans-Wilhelm Barking said: “It is good to first of all note that by handing over the looted painting to the heirs of the Kraus family today, the Xanten Dombauverein can make a small contribution, within the scope of its possibilities, to making good the injustice done by the Nazi criminals after more than 80 years. “No member of the board of the Xanten Cathedral Association could have imagined, when taking up his position on the board, that any question of looted art from the Nazi era would arise. It is to be noted that no member of the board experienced the Nazi period themselves. Graykowski said the intention of his family is to give the work at the Jewish Museum in Vienna to be displayed as part of an exhibition of works that were lost during the Holocaust.